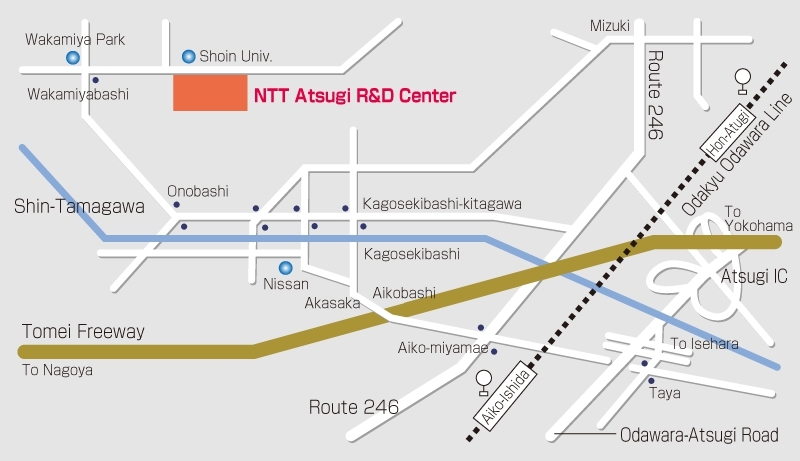 ・catch one of the following buses at bus terminal No.4: "Mori-no-Sato" bus (Ai17) , "Shoin University" bus (Ai18), "Nissan Advanced Technology Center" bus (Ai19,Ai21) . Get off at the Tsushin Kenkyusho Mae(Electrical Communications Laboratories) bus stop (about 20 minutes). 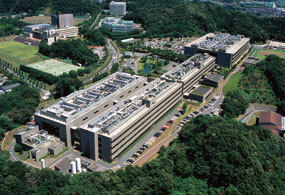 Get off at the East exit of Hon-Atsugi Station and go to the bus center(6 minutes by walk). 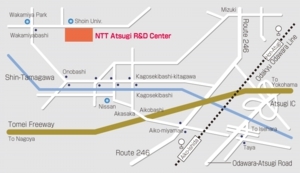 ・Then catch the "Mori-no-Sato via Akabane Takamatsuyama" bus (Atsu44) at the bus terminal No. 9. Get off at the Tsushin Kenkyusho Mae(Electrical Communications Laboratories) bus stop. (about 25 minutes). 15 minutes from "Aikou-Ishida" Station. 20 minutes from "Hon-Atsugi" Station. Leave the Tomei expressway at the Atsugi Interchange, taking the Odawara-Atsugi Road. Soon take the exit to Isehara. Continue along the side road under the express way. Then turn right at the third set of lights (Taya crossroads), cross Route 246 and continue towards Aikobashi and Akasaka. Turn left at the Kagoseki crossroads and then continue ahead. Turn right at the Onobashi Wakamiyabashi crossing and continue up the hill. The lab is on your right(about 20 minutes).